This is the best organic lip balm recipe I’ve ever made. This is an easy peasy organic lip balm recipe to make with ingredients you can pronounce. No ick here! You’ll find it less expensive than the store-bought equivalent too. The ingredients for my best organic lip balm recipe are linked for you. You’re going to love that this easy lip balm has only 4 ingredients! 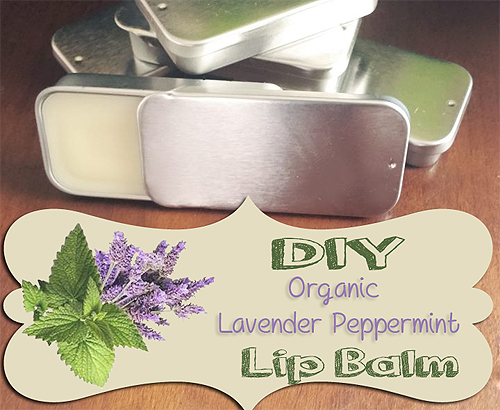 This time I am making Lavender Peppermint Lip Balm. This is my favorite, but feel free to experiment scents you like best. BONUS – You can make lotion bars with this same recipe! 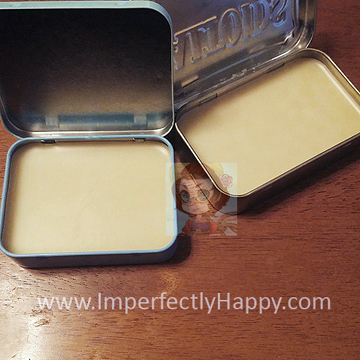 Using the same measurements you can make 2 Altoid tin lotion bars. Be careful to only fill to just below the hinge or you’ll make a mess. Now that you have made these you can test out all kinds of scents. Want to add a hint of color to your organic lip balm? Try these powders – just remember a little goes a LONG way. If you like this recipe, be sure to check out my Honey Whipped Hand Cream recipe! Can I put this in lip balm tubes? I have a bunch I bought already. Thanks- & thanks for the recipe!